Kendall Rogers: PD — I’ve been encouraged by TCU’s performance the past two weeks. The Frogs are clearly much better offensively and the rotation will be strong with Lodolo-Janczak-Williamson. The one, maybe, concern I have right now is not having Caleb Sloan and Russell Smith in the bullpen. TCU will need to avoid further injuries or that will become an issue. But so far so good. PD: After a couple of weeks, I’m pleasantly surprised by my Horned Frogs. We seem a lot deeper and versatile in the lineup and much better defensively. Pitching has been up and down, but once Janzcak gets into the flow of things I really think this team could make another Omaha run. Too soon? Kendall Rogers: Guest – I think you’ll see that happen unless Pat Casey decides by June he wants to come back for another season. Remember, Casey has the option to say he’s coming back until June. Pat B and his staff have done a phenomenal job so far this season. Guest: What will take to remove interm label on OSU coach Pat Bailey? Kendall Rogers: JK — I was impressed with the sweep for Sam Houston State, but I also thought the Bearkats were going to be pretty good this season. SHSU has a really deep staff and I think what stood out to me is they get in trouble with the starter on Saturday and are able to turn it over to a quality arm like Matt Dillard. SHSU has a chance to make a big, big splash this weekend. jkolek: What are your takeaways from the Sam Houston State sweep of Louisiana? Kendall Rogers: Luke — Nah. It’s just one weekend. Everyone knows he’s a premier hitter. There’s a reason in baseball getting a hit 30% of the time is considered impressive. It happens. Luke: Everyone was reporting that Wallner looked electric in pre-season practice. Do you think this weekend takes a huge hit to his draft stock? Kendall Rogers: TD — I think it will be a solid series, but I like LSU two out of three. I think I trust LSU’s bullpen and offense a bit more right now, though, I still have major reservations about Zack Hess as the Friday night starter. This is a big weekend for him, IMO. TD: LSU on the road to Texas this upcoming weekend for a stiff test with the Longhorns. How do you see it playing out? Kendall Rogers: Dozsa, Love to see Coop getting the Lions going so far this season, but they definitely have something to prove with their opponents so far this season being Monmouth and Fairfield. With that said, Bailey Dees was an intriguing arm to watch. Dees has struck out 12 and walked just three in 12 innings, with teams hitting him at just a .167 clip. That Duke series this comping weekend should tell us a lot about Penn State’s improvements. Dozsa2: Penn State is 6-0. Are the Nittany Lions a threat in the Big Ten? Kendall Rogers: Brandon — I think Tech has plenty of quality depth, the key is getting consistent outings. I thought Mason Montgomery was solid over the weekend, allowing just two runs in five innings. I think Tadlock will continue to tinker with things until he finds the right formula. My money is on Tech finding that formula. But in the meantime, it’s impressive that when the pitching isn’t the greatest, the Raiders have an offense that can mask those issues for now. Love their club. Brandon: Early season thoughts on TT’s pitching depth? Aaron Fitt: I think the new Dudy Noble is the new gold standard for college baseball parks — it’s got every amenity, and every little detail is so carefully considered (much like South Carolina’s park in that regard). And they did a fantastic job maintaining the character of the LF Lounge while bringing it up to modern safety standards. Also very high on MSU’s team — check out last night’s Fitt Bits for my takeaways on the Bulldogs. Fred: After spending the weekend in Starkville, what are your thoughts on the team and new stadium? Aaron Fitt: Shotgun Spratling will be there! He’s usually on the West Coast, so I know he’s really looking forward to getting a taste of that atmosphere. Chris: Will any of you guys be at Carolina-Clemson series this weekend? Aaron Fitt: Yeah, as Kendall alluded to, ASU is very much on our radar, but the standard SOS caveats apply — they have feasted on lesser competition early. Still, as I wrote last week, I think ASU will be one of the very best offensive teams in the country — maybe even THE best. They’ve come a long way. I think their offensive talent is very legit. Nate: SEC guy here but really curious to see how Arizona State has gotten off to a hot start offensively. How do you see that playing out for them over the next couple of months? Kendall Rogers: Chris — In terms of standouts, I loved Nolan Crisp. Such a bulldog on the mound and he isn’t wasting time getting the ball to the plate. Sully said more veterans need to pay attention to how he approaches the game, which I think is telling. Offensively, Kendrick Calilao, Brady McConnell and Jud Fabian were all impressive, especially Calilao. He has power to all fields. The Gators will go through some ups and downs offensively as these young guys gain experience, but I think they’ll finish strong with Nelson Maldonado, Brady Smith and others potentially heating up. On the mound, Tommy Mace was awesome over the weekend. 94-96 with his FB and electric overall stuff. If I am a betting man, he’s UF’s Friday night starter to being SEC play. Aaron Fitt: I’ll be there. Most excited to see Texas Tech (since I just saw MSU). That offense looked scary this weekend. And Sam Houston has a lot of good arms, looking forward to seeing that pitching staff. And can Nebraska bounce back from a rough weekend? Lots of neat things to watch in that tourney. KD: Who is going to be covering the Frisco Classic this weekend and what are you most looking forward to out of those 4 teams? Aaron Fitt: Because (a) a team in front of Coastal dropped out, so there was room for other teams to move up, and (b) Coastal still had a very good week, going 4-1, with four blowout wins against good programs, and a tough extra-inning loss on Friday — any team would move up after a week like that, provided there was room to go up. NC State, as I mentioned, was team No. 26, and this was a great week for the Pack… but the opening weekend against Bucknell was just not a rigorous enough opponent to give NCSU the edge over Illinois, which went on the road and earned a win over Wake Forest (a good team that has gotten off to a sluggish start), then swept FAU on the road. Pack: Why would you have Coastal going up in the poll after losing at home to NC State, who you still have unranked? Kendall Rogers: Aaron saw Arizona State out in Arizona two weekends ago, and I’m extremely impressed with what ASU has done as a whole right now, but we’re waiting on the Devils to record some wins over better/marquee opponents.. For me, ASU is kind of in the same boat as Tennessee, though UT has played a better opponent than ASU so far this season in Indiana over the weekend. ASU is definitely on our radar. Good to see Tracy get those guys back on track. We’ll see if it sticks. Eric Simmons : Why isn’t Arizona State ranked after a 7-0 start? Aaron Fitt: I haven’t gotten a report on his stuff yet in these first two starts, but I’ve seen him before, and he can really, really pitch. He’ll get it up into the low-90s, with good feel for his breaking ball and changeup. Just a very advanced, polished strike-throwing veteran lefty. He’s gonna win a lot of games this year, and I think he has a real chance to be a Day One draft pick. Hottub: Any reports on Michigan lefty Tommy Henry? The stats have been dominant. Aaron Fitt: Our first teams out was NC State, that was team No. 26 (we gave the edge to the cold-weather team that has a few more quality wins — sweeping FAU on the road was a good statement for the Illini). Tennessee and Arizona State have played themselves up into the discussion as well. I’d put College of Charleston on the board after winning a series from UConn (which was Team 26 last week). I assume you’re an Oklahoma fan — and yes, your team has played its way into the mix as well. Good week for the Sooners, with a nice midweek win over DBU, and a 2-1 showing at Tony Gwynn. Our Shotgun Spratling saw OU this weekend, and he reported to us that they are “intriguing.” I think that fits. Interested to see how the young guys on that club develop. Sooner in Austin: Which programs are right on the cusp of being in the Top 25 rankings? Kendall Rogers: Bryce — We had Texas as a team in the 20-25 range in the preseason with Hamilton, so without Hamilton, I actually thought they might struggle a little more than they have. The big key for Texas right now is the rise of RHP Bryce Elder. I was surprised when Elder was starting on Friday opening weekend, but he’s lived up to the offseason billing. He was up to 93-94 mph with his FB and showed excellent feel for the breaking ball the past couple of weeks. The Longhorns have also done enough offensively to win games. The ultimate test is this weekend against LSU, but so far so good. David Pierce and his staff are doing a solid job. Bryce Lee: Impressed by the Longhorns early. With David Hamilton healthy, what could Texas potentially do this season? & now obviously without, where do you guys see them? Aaron Fitt: I was encouraged by the arms I saw from Fullerton last Friday and Sunday (I missed them Saturday). Michael Knorr is going to be a typical Fullerton freshman weekend guy, kinda like what Bibee was last year — he’s got feel for pitching and decent stuff. Velasquez and Landon Anderson are nice reliable bullpen pieces, and Weisenberg has a big arm. Jury is still out on that staff, but I agree with you that the lineup is quite good, and I think they’ve got enough on the mound to be right in the mix to make a postseason run as usual. Alex K: Fullerton this year is unlike a typical team of year’s past. Seems like they have an excellent hitting team, with at least three super freshmen in the line up. Will they figure out the pitching besides their Friday ace Bibee? If they do, they have to be considered a serious CWS contender, agree? Kendall Rogers: Frank — Minnesota is struggling, but I definitely though that was an impressive series win for DBU. I wrote about the Patriots last week and I continue to be impressed with lefty Jordan Martinson, who struck out eight in six shutout innings against the Gophers. DBU got it done offensively the rest of the weekend, too. DBU will be in the Top 25 mix if it continues to take care of business. Frank: Were you impressed with Dallas Baptist this weekend? Big mid-week with Baylor this week. Aaron Fitt: Ike Freeman is a really good player. Dylan Harris did some hugely important things this weekend — he’s a real impact juco guy, plays really hard and can impact the game in a lot of different ways. Our Josh Conner saw the Heels this weekend, and he wrote a piece focusing on the UNC rotation — look for that this afternoon. Mike: Thoughts on unc to start season?Ike freeman swinging a hot bat. Aaron Fitt: Fun little question. I’m gonna go Vandy’s offense vs. Mississippi State’s pitching — since this is a fantasy, I might as well take advantage, because Vandy and MSU won’t play each other in real life this year. Rocketcoach7: If you could pick a matchup you would like to see of a batting order against a pitching staff for a weekend series, who would it be? Kendall Rogers: Anon — Going back to Aaron’s question about the best pitching staffs in the league, A&M night have the top one-two punch in John Doxakis and Asa Lacy. Both have put up insane early numbers (albeit against junk competition), but the stuff has been crisp, too, with Lacy bumping 95-96 over the weekend. With that said, A&M is in a world of trouble offensively, hitting just .234 against sub-par competition. That must change starting this week at the Shriners tournament or it could be a long season at the plate. But the Aggies certainly have the arms to do big things. Aaron Fitt: I have zero long-term concern about Stanford’s offense; really like the personnel there. Deep, athletic, physical lineup. And they showed some flashes of explosiveness last week in Arizona — I saw them beat up on Grand Canyon pretty good last Monday. I’m in on Stanford’s offense. Ted : Stanford has gotten off to a solid start, but their hitting isn’t exactly on fire. Short-term statistical blip, or something of concern? Aaron Fitt: I’ve always admired Savage’s philosophy when it comes to recruiting and developing arms: the bedrock of UCLA’s program is fastball command. They prioritize that trait in the recruiting process, and they look for guys that have projectable frames and good lean arm actions who might have below-average fastball velocity now, but will grow into more velo as the mature, and they already know how to command it. I love that model. 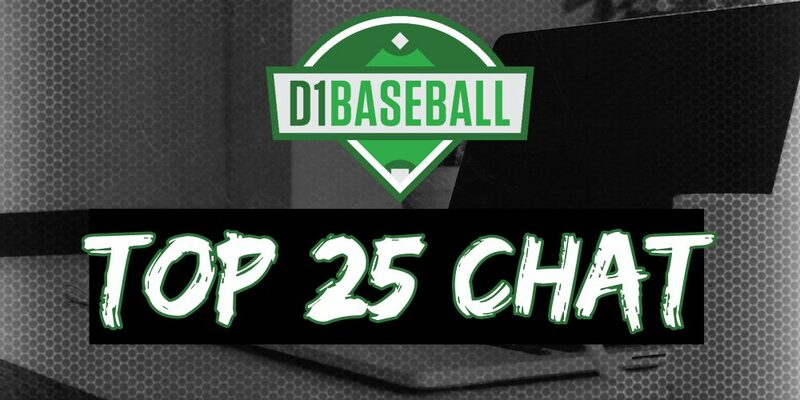 Bobbruinbear : Is it time to recognize Coach John Savage as someone who has the ability to see perspective pitchers signees differently than other Coaches? He has baffled many of us with his selections. Despite this he always turns out being correct on who he signs. How do you think he does it? Aaron Fitt: I wrote this weekend that Small and Ginn has a chance to be the SEC’s best one-two punch atop the rotation, and if James can get more consistent with his command, it certainly can be the SEC’s best rotation, because James has very good stuff. Very high on that trio. Jackson: Does MS State have the best rotation in the SEC? That Small-Ginn combo has been lights out so far. Kendall Rogers: Carter — I actually feel pretty good about Auburn over the weekend. I thought UCF would win that series even with Davis Daniel potentially pitching and the Tigers won the series without him. Kyle Gray really struggled and I think you’ll see Jack Owen in the rotation soon. He was solid over the weekend — 89-91 with the FB and the change was really effective against UCF’s aggressive hitters. The offense definitely woke up, and I really liked Kason Howell and obviously Williams on Saturday. Holland had a quiet day, but he’s dealing with strep throat. AU is going to hit, but it can’t sustain another injury with Daniel on the shelf for an undetermined amount of time. Carter: What should one make of this Auburn squad? Scrambling to fill the rotation especially without Davis Daniel in the immediate future. Greenhill, Anderson, and Watson have all showed a lot of promise so far out of the pen. Butch appears to like using Anderson as his set-up man for Greenhill. Skipper and Owen appear to be the next two in line to get a crack in the rotation when Cincy comes to town this weekend. The Auburn lineup appears to have woken up a tad in Orlando. The freshmen don’t appear to be scared of the stage. Steven Williams heated up this weekend a little. Julien is tearing the cover off the ball. The only missing piece appears to be Will Holland. He hasn’t gotten rolling yet. Do you guys see him heating up and taking this lineup to the next level? Do you see the freshmen continuing to compete and look like they belong once SEC play starts? Aaron Fitt: USF was my non-field of 64 sleeper heading into the year, and I’m still pretty high on them. No shame in losing three tight games to a top-5 team on the road. the pitching depth stands out most, and Collin Sullivan apparently pitched very well in the opener, which was good to see — they need him to have a big year, and he’s got a nice arm, up to 93 in the fall with a promising slider. Offense will be a work in progress, but UNC has one of the most talented staffs in the country, so I wouldn’t read too much into this weekend’s struggles. Bob: What are your thoughts on USF Bulls? They had a chance to have a great week but instead went 1-3, losing 3 tight games to UNC. What do we have to look forward to? Kendall Rogers: Reid — I think I’m a little surprised by Oregon State’s overall play. Really, if you look at the pitching staff, the only negative so far is that Grant Gambrell continues to pitch very timid. He needs to go out and trust his stuff. But the staff as a whole is dominating right now. Offensively, the Beavs have definitely surprised me with Alex McGarry hitting well over .400. I think I expected at least a step back after losing the key cogs they did offensively from last year’s club. But so far, it’s been same old same old. We’ll see if that continues, but it’s been impressive for sure. Reid: Oregon States start surprising at all? I mean I know that we have gotten used to them being good no matter what, but seems like they lost an awful lot going into this year to come out and still look this good. Aaron Fitt: I’ve always liked Baum — it’s a premium athlete with three very good pitches, a fastball that can reach 94, a putaway breaking ball, and even a good changeup. The issue with him has always been strikes — and he’s currently got a 19-1 K-BB mark, which is extremely encouraging. If he keeps on pounding the zone… yes, I could envision him making a run at the first round. He’s very talented. Hottub: Tyler Baum has been excellent so far as UNC’s Saturday guy, what kind of stuff is he bringing and does he have a chance at slipping into the first round? Kendall Rogers: Devin — I’ve been encouraged by Arkansas’ start. If you look back at last season, USC gave the Hogs all they could handle in Fayetteville, and I know the Trojans have had this series circle for a long, long time. Still, the Hogs performed at a high level and took the series on the road. I would still like to see Isaiah Campbell perform at a higher level. That is absolutely crucial as SEC play nears. Devin: How do you feel Arkansas has looked so far in the early season? Aaron Fitt: Honestly I don’t think it’s a big concern — because like you said, those four guys have real talent, and they’re ready to play right away. I knew Robby Martin would hit the ground running, he’s just a Hitter with a capital-H. Cabell was my preseason pick for ACC FOY, so his good start is certainly no surprise. I believe De Sedas was the highest-ranked incoming freshman hitter in the country according to PBR — but I must admit I was a little more concerned about his learning curve heading into the season, after some of the reports I heard in the fall and winter. So it’s been very encouraging to see the way he’s controlled the strike zone and driven the ball with authority. Obviously it will be a different matter once these guys face better pitching, but so far, so good. B Mand: How much of a concern is it that FSU’s offense relies so heavily on 4 true freshmen? Granted, they’re incredibly talented freshmen, but I can’t remember 11 having to count on so many young guys all at once. Aaron Fitt: I certainly felt better about the bullpen when I thought Jake Agnos was going to be a part of it… but obviously Agnos has been great as a starter so it makes sense to leave him in that role. I think Trey Benton is really the key — he’s too talented to keep scuffling, they need him to be better, and become the moment-of-truth stopper in that pen. Otherwise, the arms back there aren’t special, but they’ve got enough veteran guys with pitchability that they should be OK, between Voliva, Colmore, and Lanier. Still think the freshman Carter Spivey is going to be an important piece too, he’s got a good arm. Scooter: How much is East Carolina’s bullpen going to affect them this year? This reason I say this is obviously the Monmouth loss yesterday. Aaron Fitt: Maybe Kendall can weigh in on this one when he gets here, since he just saw the Gators — but I think we realized last year that maybe Dyson wasn’t quite in that Faedo-Singer-Shore class yet, as we thought he would be after his freshman year. We were cautiously optimistic heading into this season, especially after it seemed like he made progress in the fall… but it was still a bit of a wait-and-see approach for us. I think you’re probably right that he’s behind Mace and Leftwich in the pecking order because he’s just not consistent enough with the command. Andrew: I know it’s only two starts (I promise I know that), but is it time we all admit we got a little over our skis with the idea that Tyler Dyson was the obvious successor to Florida’s Shore-Puk-Faedo-Singer line? The problems he had Friday night – inefficiency, poor command, inability to translate stuff into results – have been there all the while. His career at this point is basically one great relief appearance in a super regional and one great start in the College World Series. Isn’t he pretty clearly Florida’s third-best starter at this point? Aaron Fitt: I’ll have a better answer for you after I see the Beavers for three days in Seattle in Week Four. Aaron Fitt: Entirely possible. I think we graded OSU’s pen as a 70 heading into the season, and that was without knowing how good some of those young righties would be. The early reports on those guys have been very encouraging, and of course it’s hard to beat Eisert, Mulholland and Chamberlain from the left side. Definitely strongly in the discussion for best bullpen in the country. Matt: Does Oregon State have the best bullpen in the country? We knew the lefties would be good, but it’s looking like they’ve 2/3 good arms from the other side of the bump as wel with Pierce, Pfennigs and Burns all having 3+ IPs and no runs against through the first two weeks. Aaron Fitt: Yes, Tennessee did jump into the Top 25 discussion this weekend — I still believe that Indiana club is going to be quite good, so it was very loud to shut down the Hoosiers the way Tennessee did. Is it sustainable? We’ll see; I’ve talked myself into the Vols after hot starts before, and been burned, so I’m going to proceed with caution. I do really like the core of arms there, and I’ve heard good things about Crochet’s stuff in that bullpen role — I think he’s well suited for that. Stallings is a really good competitive SEC ace, and Linginfelter has done better as a starter than I frankly expected. The mound talent gives Tennessee a real chance to make some noise in the SEC and push for a regional, sure. Rob: Thoughts on Tennessee’s start? Were they under consideration for the top 25 this week? And do you think they can sustain it and make a regional this year?